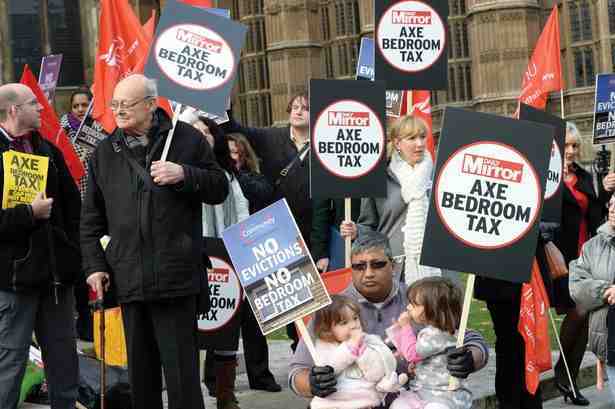 I’ve just created a Facebook event, publicising a call in today’s Daily Mirror for a lobby of Parliament tomorrow (Tuesday 12 November, 1pm) when Labour are putting forward a debate to abolish the bedroom tax (or “spare room subsidy” as the government calls it). Shadow Secretary for Work and Pensions Rachel Reeves “has booked a wheelchair accessible room in Portcullis House (Boothroyd Room) from 10am-12.30 on the morning of the debate – the idea is to orchestrate a mass lobby from there – and she’ll also be able to come and meet as many of you as possible” – according to this blog entry. I’m planning to travel from Manchester, but won’t be able to make the morning meeting (due to extortionate train costs to get there in time). However, since I’m publicising the lobby at 1pm, I really want to get there and influence other protesters as well as MPs (I plan to print off relevant entries from this blog as “ThatcheroftheLeft Highlights 3”, and talk to people of course). If you can’t come to this protest (or even if you can) consider emailing your MP via www.writetothem.com (see this blog entry for example emails) before the debate.